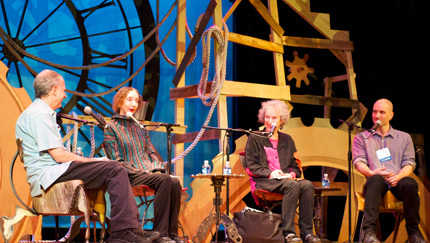 James Gleick, Joyce Carol Oates, Margaret Atwood, and China Miéville (l to r). Photo by Nick Doll. This panel discussion from the 2012 seminar was moderated by acclaimed science and technology writer James Gleick. He leads Atwood, Miéville, and Oates through a discussion of the tensions between the real and the unreal inherent in writing and reading works of fiction. “All fiction,” says Miéville, “revolves around an oscillation between recognition and estrangement.” “People read or go to art not to get answers,” explains Oates, “but for a thrilling experience that is essentially mysterious.” And while Atwood stresses fiction’s obligation to be “true to life,” she argues that even “ordinary domestic reality” (Gleick’s phrase) often appears surreal, wild, or supernatural when depicted truthfully. The novelists also discuss the readerly tendency to try to “decode” or “understand” strangeness in fiction and the exceptions to rules that create great works of art. “You can do anything you want” in fiction, says Atwood, “if you can pull it off.” Along the way, the novelists discuss a range of influences and examples, including German author Franz Kafka, Irish satirist Jonathan Swift, science fiction writer J.G. Ballard, philosopher George Santayana, and ghost story writer Algernon Blackwood. This recording is available for noncommercial and educational use only. All rights belong to the authors. © Margaret Atwood, James Gleick, China Miéville, and Joyce Carol Oates. Used with permission from Margaret Atwood, James Gleick, China Miéville, and Joyce Carol Oates. This audiotape is wonderful! The commentary of the panelists is just great and you can feel a little of the tension in the dialogue, even on tape. So well done, thank you for making this available.